Recently I have posted for Service Broker for single database in which I have explained it with table history example and it was invoked within a trigger. It was a for a single database, here I will explain service broker for between databases. In an earlier post of service broker with single database messages were traversed from INITIATOR to TARGET only. But with this post we will go for the communication in a bidirectional way, means from INITIATOR to TARGET and from TARGET to INITIATOR. Service broker has two end called TARGET and INITIATOR, so target and initiator will be on different databases for this example. Before going ahead this post, I would like to you, read the earlier post for a single database. Have we read it? What we do now? 1.Create a request & reply MESSAGE TYPE for target and initiator. 2.Create a CONTRACT that specifies the messages between target and initiator. 3.Create an QUEUE for target and initiator. 4.Create a SERVICE for for the created Queues above. 5. Send a message from initiator to target. 6. Reply a message from target to initiator. Configuring databases for initiator and target objects, enable for service broker too. Below script do all the stuffs which are essentially required to start the conversion through service broker. We had setup service broker to collect history for any table row change in the earlier example, we will set up service broker to process order data and complete conversion with confirmation as processed or not. 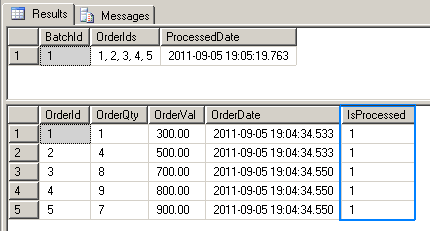 So let us create an object for order details in initiator database. 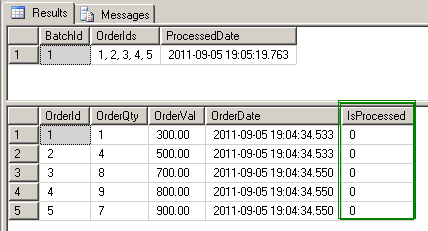 To process the order database, we need to create code in initiator database which will send a request message to target service on the target database. So we will capture only those orders which are not processed. Let us create a stored procedure for the same. As we completed the code generate and send request message, we will receive these requested message and send a reply message to the initiator after processing the requested message. A message arrived at target database and processed and also send a reply message for the confirmation process. 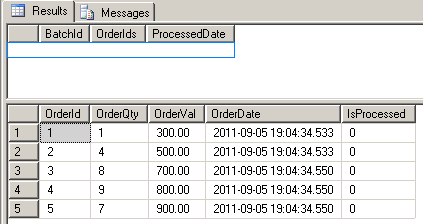 Now initiate database will mark those orders as completed. Let us do the same. We have done all the code which are required for the testing service broker for two databases. Now execute the stored procedures which we have created in initiator and the target database for a conversion of request and reply message and reviewing records again in both tables. It turns to complete the process and end conversion for processing orders and reviewing a confirmed processed orders in tables. The testing mode is completed and hope you liked this post, maybe help you. Nice conversion!